Today's star is blonde beauty Virginia Bruce. TCM is celebrating the career of Virginia Bruce with 15 movies on Aug. 25. Here's what you need to know about this beautiful actress who led an eventful life. FYI: TCM sometimes changes the air times and /or movies, so you can go to www.tcm.com to check the updated schedule. Born: Sept. 29, 1910, in Minneapolis. Died: Feb. 24, 1982, in Woodland Hills, Calif.
AKA: Bruce was born Helen Virginia Briggs. Brief bio: Bruce was raised in Fargo, N.D., but her family moved to Los Angeles after she graduated high school. Bruce had a lovely soprano voice; she wanted to study singing at UCLA, but her family needed money, so she started working in Hollywood. At first, Bruce was an extra, but she worked her way up to good parts like her role in Downstairs (1932) opposite her future husband, John Gilbert. Bruce took two years off to raise she and Gilbert's daughter, but she returned to the screen in 1934 after divorcing Gilbert. Bruce became a favorite of MGM's all-powerful producer Irving Thalberg, and he showcased her beauty and lovely voice with plum parts in Born to Dance (1936) and The Great Ziegfeld (1936). Bruce's career declined after Thalberg's death. She mostly appeared in B movies and radio throughout the 1940's and 1950's, and Bruce did make some TV appearances in the 1960's, but she mostly led a quiet life until her death from cancer in 1982. A soaked James Stewart with Virginia Bruce and friend in Born to Dance (1936). Fun Fact: Bruce was a lifelong progressive, and she often donated money to help the Civil Rights movement. 1.There Goes My Heart (1938), airing at 10 a.m., is a lightweight screwball comedy that owes a heavy debt to It Happened One Night (1934). The movie concerns an heiress (Bruce) who takes a job as a department store clerk to see how the other half lives. 2. Downstairs, airing at 8 p.m., is an interesting pre-code film. It is a Downton Abbey-esque tale about an evil chauffeur (John Gilbert) who seduces and blackmails his way through English high society. Bruce plays a housemaid who gets caught up in Gilbert's wily charm. 3. Born to Dance, airing at 11 p.m., is probably the best screen showcase of Bruce's talents. She introduces the Cole Porter standard, "I've Got You Under My Skin," while playing a femme fatale who charms a gullible sailor (James Stewart). A great movie not featured during Summer Under the Stars: The Mighty Barnum (1934) is a pretty standard biopic about the famed 19th century showman (Wallace Beery plays the lead), but Bruce is exceptional as the famed soprano Jenny Lind. Old Hollywood video: This is a fun clip of Bruce in the 1940 horror film, The Invisible Woman. 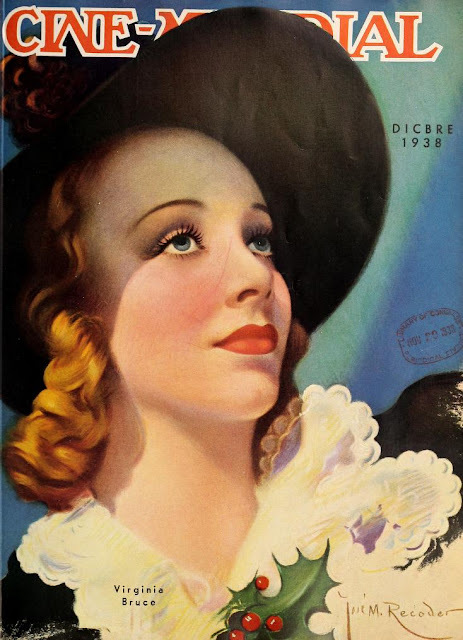 Fan Magazine Flashback: Virginia Bruce on the cover of Cinemundial. Courtesy of the Media History Digital Library. For more Summer Under the Stars articles, go here. There'll be plenty more on Bruce on social media. Follow me on Tumblr, Google+ or Pinterest or like us on Facebook. Follow us on Twitter @oldhollywood21.